This helps stiffen the steering as more friction requires more effort. I liked it. As for ride stiffness, I detect no major change over any other 40 profile tire I’ve run. Not overly harsh. But I have sacrificed lots of possible comfort for performance handling parts. 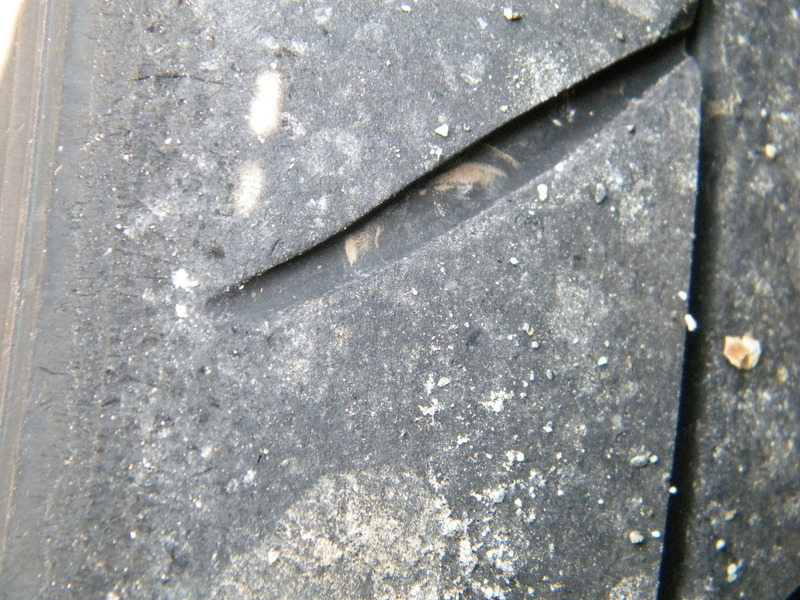 This is the back driver wheel at 36psi while the right side was jacked up. Can I feel the soft side walls while daily driving? No. It will only matter race day and I’d suggest more than 36psi then.. I took a sharp on ramp at 50 degrees Tuesday night. Was driving maybe ten minutes before that. Apparently there was no heat. With two passengers I still lost the back end at 55 and had to counter steer slightly. For reference one passenger said he took his 3000gt at 50 i on that curve. Oh and he alone weighed 300+lbs. Back at the house i felt the outsideÂ tires. They had no heat. Felt like i hadn’t been driving the car. Lesson? 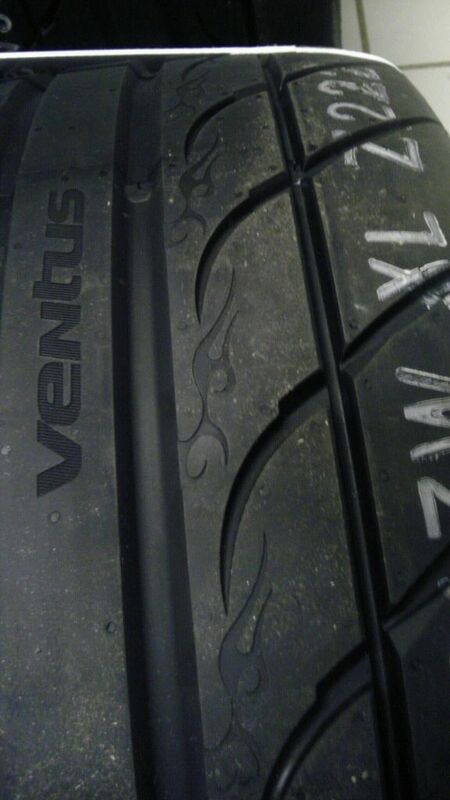 Get heat in theseÂ tiresÂ before taking risks. Very bearable road comfort. Having experienced rain and warm weather grip i would like an extra set to run track and dd sets. 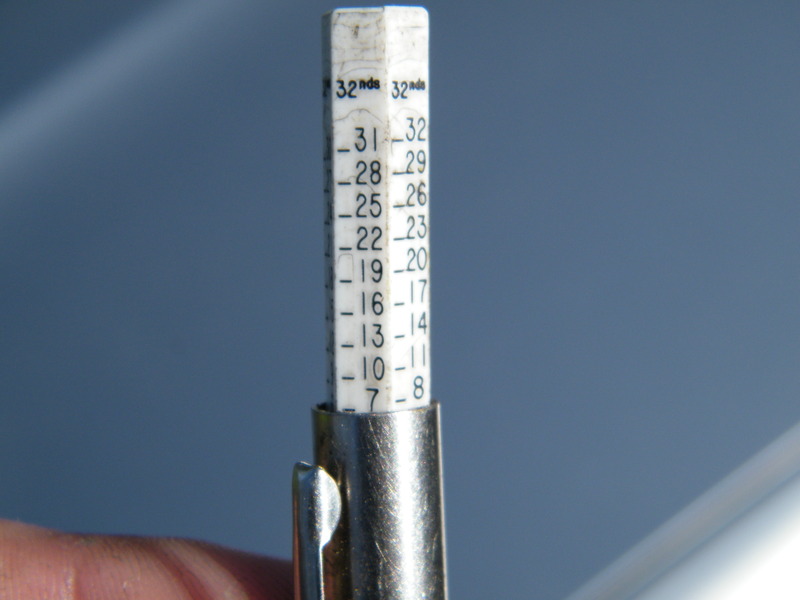 In a moderate downpour with no standing water there was no decrease in grip at highway speed. When going over standing water I heard the hydro plane noise but the wheel did not jerk or steer any where but straight. I felt it probably because of the upgraded bushings. If these have bad rain grip it must be seen on the track as i can’t vouch against them on the street. Ill update more as I get more rain time with them. My tribal flame tramp stamps are still there with 500+ highway miles. Little aggressive turning. Which I’ve never really seen before. I think it lends credit to a very soft compound. I had a chance to push into some corners with heat in theÂ tiresÂ and warmer temperatures (63) I was astounded. I know where my otherÂ tires usually fall off and they kept going. I felt a little sick actually. 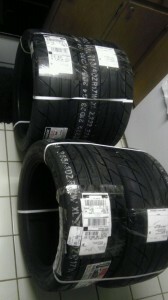 Can’t wait to test them to failure on the track. 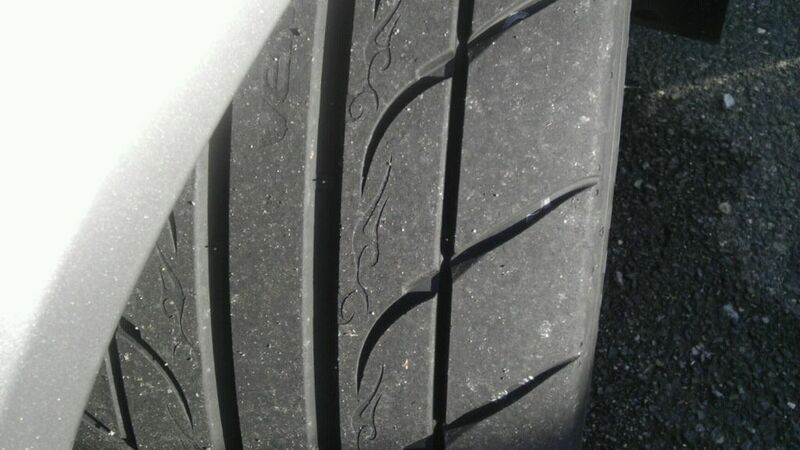 Although there are not that many miles on them yet there is no excessive tread noise. I will be monitoring this as they wear in more. Ill be updating this as I go to events and drive more. However at this point I am very impressed. 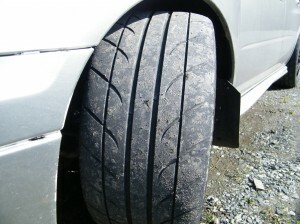 For the cost of a set of these there’s no reason not to try them next time your car needs new shoes. I’ve taken a total of 36 autox runs on 30 second courses, about 100 miles of agressive canyon carving, and the rest of it has been 97/3 Highway/City driving. Since doing some competition driving, I can say I love theseÂ tiresÂ even more. I participated in an Evolution Driving school as my first driving event in these which consisted of 20 timed runs in wet and dry with instructors driving a few runs as well. They never got greasy, rather when they got some heat in them at about 73* ambient temperature they felt mushy and pliable, which was great for grip. My times have improved greatly as I learn the feel of theseÂ tires. 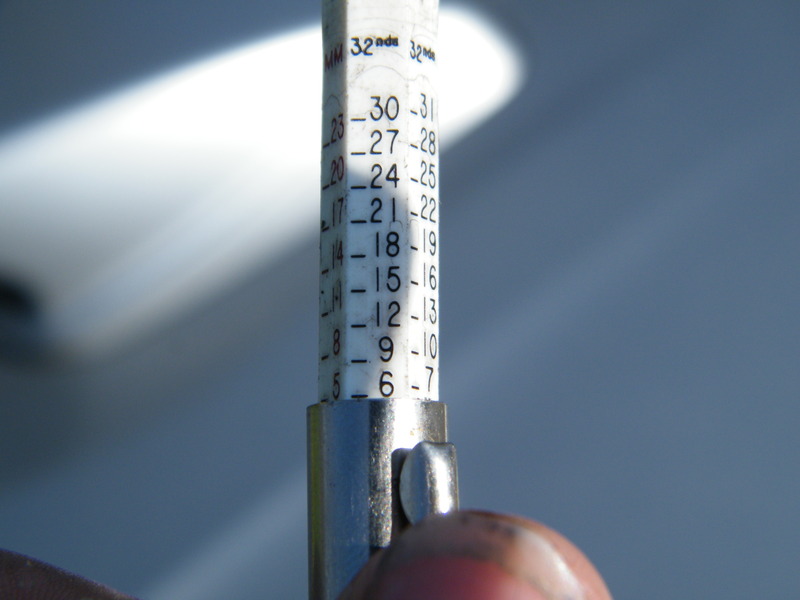 I would reccommend increasing your cold pressure to much higher than the reccommended pressures. 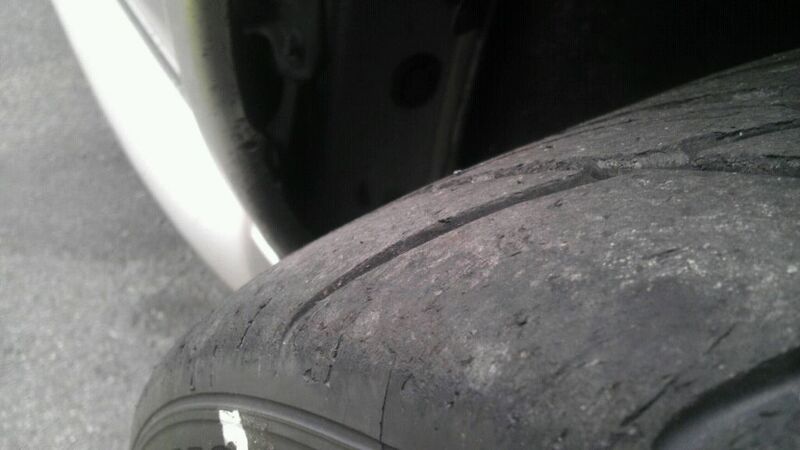 I chose to run 40 psi all the way around, and this helped to counter understeer which my car slightly has. The vehicle feels very neutral in the corners now until I apply throttle. Remember that I have many many suspension upgrages. It was 84* out at my last event and when they got heated, my times started dropping considerably, several 1/10ths of seconds. These LOVE HEAT. I’d say they don’t come into their own until you heat them well honestly. I resorted to doing a 7k clutch dump on one of the cooler parts of the day to get some heat in there. The outside edges on the front have started to wear. Before, when they were new, they had the tread to the shoulder, and it seems I have about 1/2″ to 3/4″ of baldness now. 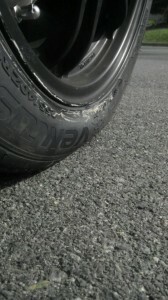 I’m not sure if this means I need more air during autox runs or if my street camber isn’t high enough. I have NOT had an alignment since I mounted theseÂ tires, so please bear that in mind. A quick check of my camber plates tells me that I have the camber set to +.8 degrees. Thats a POSITIVE .8 degrees of camber. I’ll be sure to correct this next time I have and make it about -.2 to ensure that I don’t round my edges too bad when highway driving. 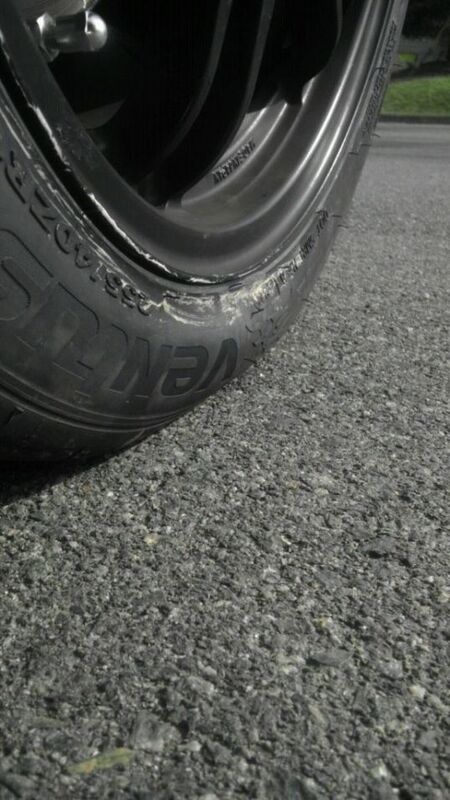 I will rotate my frontÂ tiresÂ to the back before my next event this weekend and track the shoulder wear to see if this is just indicitive of soft ply tread + aggressive driving or a camber mistake on my part. 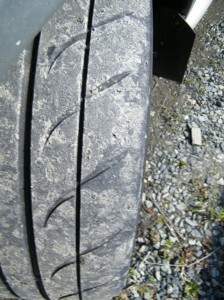 There is still no exessive loud noise coming from the tread at highway speed, and the “comfort” is nothing to shake a stick at. I don’t think most people will be using these as DDÂ tires, however I am, so that should provide more insight to wear patterns. 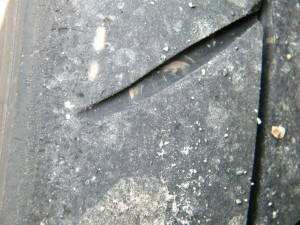 The starting tread as quoted from Tire Rack is 8.8/32″ starting. 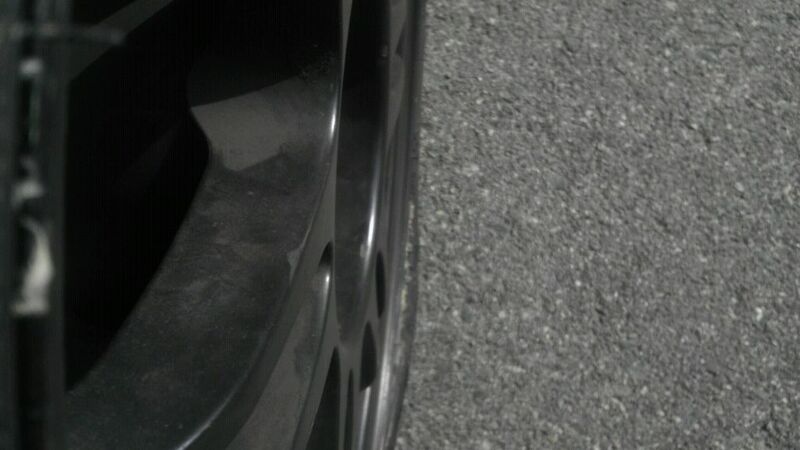 I measured the front outside/inside edges of the frontÂ tires, and the outside edge of the rears. 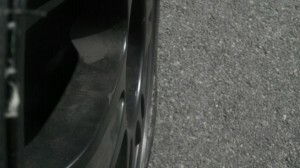 The edge depth of the frontÂ tiresÂ are a little less than 6/32nds. 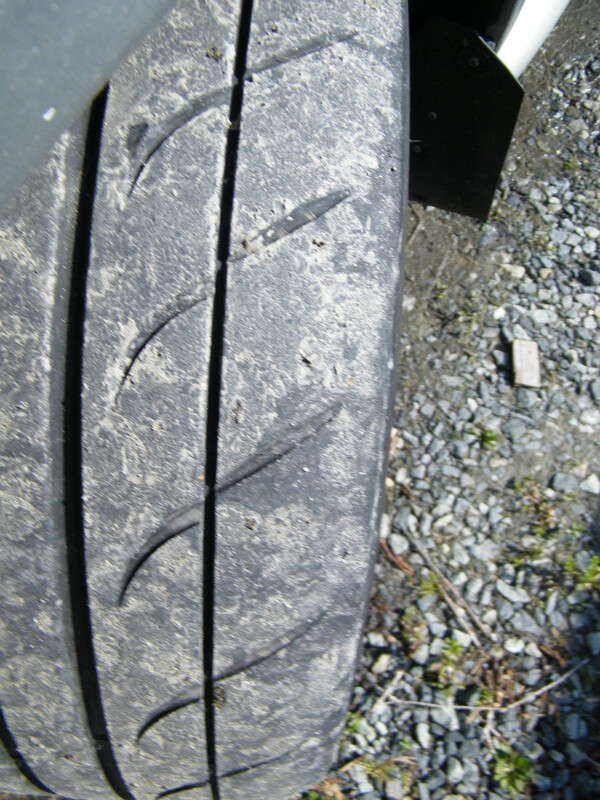 The middle tread is slightly over 6/32nds. 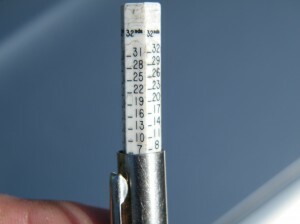 The rear depth of the outside edge is a little more than 7/32nds so I would assume the middle tread is a bit higher. I will do more in depth measuring when I take theÂ tiresÂ off to rotate, but others estimate a life of around 15000mi, and that seems about on par with what I’m seeing. I’m more concerned with if the grip will wear off towards the last big of its life, but I guess we’ll just see. I’ve driven over rougher roads since the 500 mile review and do notice a considerable bit of tramlining ( I believe thats the word) The wheels will follow moderate to large indentions in the road, and you’ll feel the car pull away from you. While it’s nothing of a safety condern (the wheel won’t jump out of your hands) it is something to think about, which I’m sure reflects the extreme performance rating theseÂ tiresÂ have, i.e hardertiresÂ will be more resitive to following pavement imperfections. If you’re using these as a dedicated race tire, you won’t have to worry about this. I still expect grip to improve as I wear these in more. I hit a moderate/severe rain storm going back from an event and when I hydroplaned on standing water, it was pretty surprising. Having driven on Continental ExtremeContact DWs I have felt near invincible in harsh rain, because while they are a max performance tire, they are incrediblty resistive to hydroplaning. 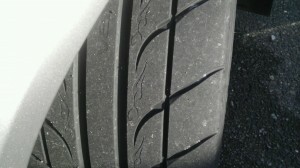 With light tread wear, the RS3s jerk considerably. I would say that this is a moderate condern, and while driving, in wet conditions, be weary of standing water. I would slow down during several sections of water logged road where there was approaching traffic. The temperature during this storm was a low 54* so that may attribute to the low traction conditions. I did not ever have to drive both frontÂ tiresÂ through a puddle at the same time. As a dedicated racing performance tire, you you can’t go wrong. Especially if you don’t have the cash to fork out double what these currently cost or more for R-Comps. You can easily strap these on your car for a 100+ mile drive to an event and have no worries about throwing another set in your car to switch out at an event (which can be a real pain) and the set will easily last a full year of heavy participation. If you plan on tracking these at an HPDE event, I can’t predict the handling and lasting tread, as I have not yet had a chance with these, but in the autox arena, these are amazing, and meet the bare minimum treadware of 140 for Tire Pax. If you are considering these as a summer set ofÂ tires, again they are excellent, which is why I still have them on the car instead of a lesser set of Bridgestone Potenza RE050As. Yet consider the faster treadwear and 15000 mile predicted life, as well as the wet traction concerns. Stay tuned in the next few weeks for interval update.